You Can’t Take Away My Joy – God's Grace ~ God's Glory! Jerry came wheeling into the kitchen last night, asking if I was still cleaning. “Sure,” I said, knowing that he was aware of my nightly schedule after dinner. In writing Two Full Plates ~ Learning to be a Caregiver I realized that the Lord began preparing me for this role, and the reward of it, when I was only a little girl, trained at an early age to wash the dishes and make the beds everyday. Today these are done as naturally as brushing my teeth, although more rewarding. These are also good times to memorize and practice the hymns and psalms that we will be singing next Lord’s Day. 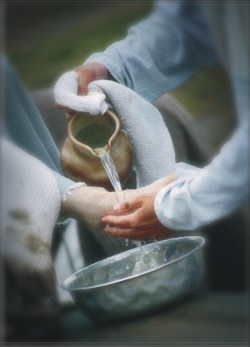 Jesus washed the feet of His disciples as an example for us, but more than this, died for us, to deliver us from the drudgery of the world, and to know the joy in serving Him and others. In His presence is fullness of joy, no matter the task. Work can be drudgery or a joy depending on the heart and the spirit. A task done, as unto the Lord, and to His glory, is not work, but a pleasure. The mind and the heart follow where He leads no matter the place or activity. Dear Father, thank you for teaching us, and by your Spirit working in us, the joy of each day’s work and pleasure in you and our Lord Jesus Christ. In His name I pray. Amen.